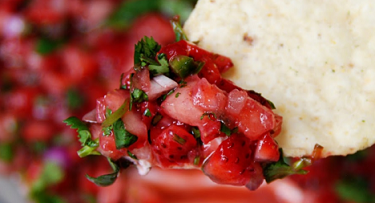 Consider this Strawberry Salsa when you are having halibut or cod or pork or chicken for dinner. 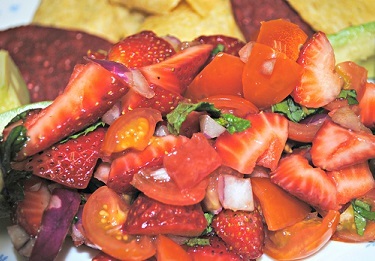 Try this restaurant salsa recipe for to enhance the meal? This restaurant salsa recipe goes great with most fish, shrimp, chicken and pork. You can also use this restaurant recipe with tortilla chips. Restaurant customers tell me it is one of their favorite restaurant recipes for salsa. 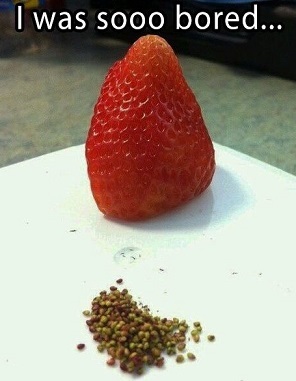 Preparation time: 20 minutes. Makes about 5-6 cups. That's all there is to it, but you'll be pleased with the results. Serve on the side for chips or top your fish or chicken or pork chop with this restaurant salsa. It really is delicious. Did you know? 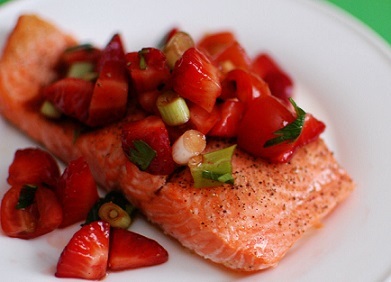 Strawberries contain more vitamin C than oranges do!